Title text: "This one is perfect in every way, except that for some reason it's woven from a tungsten mesh, so it weighs 85 pounds and I'll need to carry it around on a hand cart." "That seems like a bad--" "BUT IT HAS THE PERFECT POCKET ARRANGEMENT!" 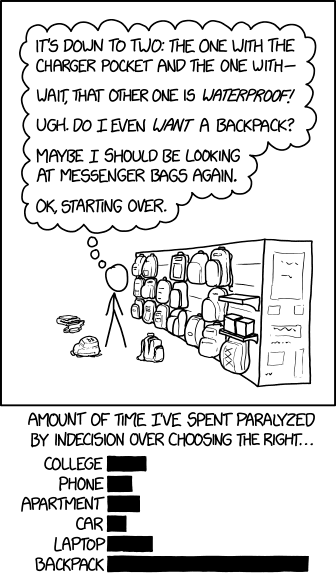 I don't know that I'd go quite as far as this comic, but I've spent a good bit of time deliberating between bags based on pocket arrangement vs material vs strap configuration before. In my case, strap configuration tends to win - I can work around sub-ideal pockets if the bag is comfy, but if the straps are bad I just won't use it no matter how well the pockets are laid out. Well, not backpack but I definitely spent more time deciding on which turntable or amplifier to buy than deciding on what I think you'd call a "major". Bad graph. Replace bar chart with scatterplot of deliberation time vs. cost of product. In my case, I suspect the items I've spent the most time comparing and perseverating over microfeatures are things I ended up deciding I really didn't need to buy anyway. Off-track: randall really never considered this or this or this? I'm really surprised by this. I thought he would have a comic about the Falcon Heavy for sure. Maybe he drew a comic depicting it blowing up and had to quickly figure something else out instead. Stargazer71 wrote: I'm really surprised by this. I thought he would have a comic about the Falcon Heavy for sure. He's obviously considered going on a trip. The Tesla on the way to Mars had a 'mannequin' seated in it. I think the subtle message is clear. It has a Tungsten Mesh, so it's fire proof and melt proof - that is everything inside the backpack will combust and/or melt before the backpack will. On the other hand, that seems a bit like overkill. I occasionally find myself deliberating extensively over certain relatively trivial things. Something that may help is to just set yourself a timeout that if it starts to take an unreasonable amount of time to just pick one and go with it. Chances are by that time your choices have been narrowed down to a few that are each more than adequate for what you really need it for that you shouldn't regret not going with one of the other options. I know it can be hard, but just stop deliberating and pick one! (which I've found myself saying to my kids who have this problem when selecting what candy/toy/whatever they want to choose and I just want to hurry up and move on to the next task). Another application is figuring out a strategy in a video game between options which are comparable to rock-paper-scissors(-lizard-Spock). Well, if so, I hope he read PackingForMars before picking out his backpack. Plus I hear SpaceX is really really strict about the size of your carry-on luggage. cellocgw wrote: Plus I hear SpaceX is really really strict about the size of your carry-on luggage. Just one of the many factors involved in making the decision complicated! For my brother-in-law, every bar on the chart needs to go off to the right quite a bit more, to the point where you can't see their ends and can't tell which one took longer. Yeah, he probably spends more time deliberating about camera bags than the camera itself, but that doesn't mean he doesn't spend years deliberating about the camera. In my case, spend an inordinate amount of time deciding on the perfect backpack, and then decide that the ratty one I'm using now can still last a bit longer despite one of its shoulder straps being torn and worn down to a thin strip of (nylon?) fabric I expected to fail years ago. I think I'll call it Timex. Okay, now that I've figured out what backpack I need for everyday, it's time to get a hiking backpack. This should be eas.... Aghhhhhhhh! Why are most backpacks black? I would like something very much like my ancient Targus (durable, lots of pockets, black ) in yellow or orange with wide scotchlite strips. I walk outside at night, and I want to outshine a driver's dodopaddle (er, "smartphone") screen. Yes, I have a fireman-yellow jacket and scotchlite ankle straps and a bike blinker in the back mesh pocket, but idiots racing up from behind are worrisome. Last edited by keithl on Wed Feb 07, 2018 7:17 pm UTC, edited 1 time in total. Stargazer71 wrote: I'm really surprised by this. Well, they are the competition, after all. Good thing I don't have to decide on a backpack for the next ~20 years. That is, it's showing no significant wear over the past decade and I'm using it less and less, so it should work for at least another decade. And if it doesn't, I'll simply go and find the same backpack since it holds up for at least a decade. It may not be stylish, contain exactly the right pockets nor have any cool features, but it's a good apparatus to carry things on your back. keithl wrote: Why are most backpacks black? I would like someting very much like my ancient Targus (durable, lots of pockets, black ) in yellow or orange with wide scotchlite strips. I walk outside at night, and I want to outshine a driver's dodopaddle (er, "smartphone") screen. Yes, I have a fireman-yellow jacket and scotchlite ankle straps and a bike blinker in the back mesh pocket, but idiots racing up from behind are worrisome. Black works well across nearly all clothing, stains are less noticeable and it stays roughly the same colour after years of wear and exposure. Where I walk/run outside at night, there is hardly any traffic (and I guess fewer idiots looking at their smartphones while driving). I don't even dress myself to be more reflective. And of course, it being the Netherlands, any road that's mildly traveled has lamp posts everywhere. I've actually been disappointed in the availability of bags that are actually all black, and don't have some high-contrast touch of color to them somewhere. Especially since that's almost never the color I would actually want if I had to have a color: green. The fact that my newest backpack came in a mix of grey and soft blue was actually a selling point for me since it was nice to do something different than black. And the size so I can carry both a knitting project & my lunch (or do lots of yarn shopping). Also the arrangement of additional pockets and their sizes. And the 2 mesh net water bottle pockets. It might have taken me a good while to find a backpack I'd like. The tiny set of interior pockets where I can store 2 power banks and a charging cable together was just icing on the cake. As was the extra pocket on the front that gave me greater freedom in storing the other things like reusable shopping bags, a first aid kit, pens, and an emergency rain poncho. Also the existence of reflective strips. I'd say this is a logical conseuquence of the relative weighting of irrelevant factors. With a car or a computer, most people go in with a decent idea of the make and model they want. Or at least have a couple of major factors that will sharply limit their choices (carrying capacity, fuel economy, comfort, etc or OS, minimum memory, graphics capability). Once you've made that decision, deciding if you want it in sky blue or robin's egg blue just doesn't matter that much. On the other hand, with a minor purchase such as a backpack, the primary consideration is "will it go on my back" and will it carry stuff". Since the answer to that is yes, your down select doesn't start until you get to the secondary features, which have minimal weight, and as a result don't force the decision in a single direction. cellocgw wrote: Bad graph. Replace bar chart with scatterplot of deliberation time vs. cost of product. The first thing I did after seeing today's comic was come here for backpack recommendations--thanks for delivering! Musk's stunt was anticipated by https://xkcd.com/1866/ Russel's Teapot. Why is he surprised by this? Everybody knows the Backpack Decision Problem is NP-complete, and Randall isn't one to accept an approximate solution. All those other decisions can be made exactly in polynomial time. The only thing hard about any of them is deciding which order to visit colleges in. I have been enjoying my satchel from Kodiak Leather Co. The only issue is my daughter complaining about a buffalo dying to become my satchel. Which I replied it's better than me using a live buffalo. Reka wrote: For my brother-in-law, every bar on the chart needs to go off to the right quite a bit more, to the point where you can't see their ends and can't tell which one took longer. Yeah, he probably spends more time deliberating about camera bags than the camera itself, but that doesn't mean he doesn't spend years deliberating about the camera. In my experience, camera's aren't that hard. You just buy the half-dozen or so that fill your needs and go with it. Bags? Kind of like text editors; all you can do is write/make your own, and no one else will agree with all your decisions. keithl wrote: Why are most backpacks black? Which is why I have one with a cooler attachment. That I almost never use, because the top part doesn't have the right pockets. The bar graph needs another entry, labeled "Girlfriend". When I need a new one I just tend to go into the nearest shop and say "will this carry the things I need, is it a nice colour and is it cheap", because I'm useless at shopping. Although I do tend to look for the ones with a laptop-carrying compartment, even though mine is incredibly heavy and I don't need to carry it around all that much. golden.number wrote: Okay, now that I've figured out what backpack I need for everyday, it's time to get a hiking backpack. This should be eas.... Aghhhhhhhh! I've found that a bubble-wrap envelope makes a great laptop compartment. For a lighter laptop, a stiff cardboard envelope provides nice edge protection. Both are cheap, light, modular, and effective. I'm terribly disappointed to see that Randal Munroe did not make a comic for e-Day. It was even the e-Day of the century! 2.718 ==> 2/7/18. Sheesh! Why does pi get it's own day but e is forgotten about? How about a backpack to wear on your way to Mars?? And it's A U T H E N T I C and approved by Buzz Aldrin! randomiser wrote: I'm terribly disappointed to see that Randal Munroe did not make a comic for e-Day. It was even the e-Day of the century! 2.718 ==> 2/7/18. Sheesh! Why does pi get it's own day but e is forgotten about? What are you on about? e-day is in late July, as all good little-endians know! The International standard is 2018-02-17 for this specific case, and *-02-17 in general. Nothing else is worth discussing. The unfortunate fact that the American abomination of a system also happens to fit as well in cases like this is a simple consequence of the fact that their system is so messed up that you can't even rely on it to be consistently wrong! Little endian date systems are always wrong. Better than the American system? Sure. But still 100% wrong. I bet the string "201827" shows up somewhere in the calculation of e (and pi for that matter). Last time I bought a backpack, I not only spent way too long deciding, it still turned out to be junk. Just about the only test I didn't do in the store was filling it with 30 pounds of crap and walking through the woods for a few hours. It turned out to have seriously flawed lower attachment points for the shoulder straps. The strap was folded over several times before being sewn to the bag, and the thick folded wad of strap was on the body side of the attachment point, digging into my sides and causing sores. Naturally, I was ~1500 miles from the store at the time. When I did take it back I looked at the other bags by the same manufacturer (it had a water bladder pocket built in, so I wanted to reuse the water bladder I'd bought with it), and they all had the same stupid attachment design. If I made one of these graphs for myself, laptop would be the biggest followed by phone, then a gap, then car, backpack, and university. Apartment would be nil since I've never seriously looked for new housing arrangements. da Doctah wrote: The bar graph needs another entry, labeled "Girlfriend". I can think of a lot of funny responses to that but they're all also sad. You can't have "92" in the minutes place, so the annual "pi hour" is really the best you can do. I'm fine with celebrating e every month. It's less controversial than ½τ day and celebrating math monthly rather than yearly sounds good. Although I don't know how one would celebrate e. Put snakes on a tree trunk? somitomi wrote: Well, not backpack but I definitely spent more time deciding on which turntable or amplifier to buy than deciding on what I think you'd call a "major". heh, just spent a great deal of time choosing my first record player, decided to go cheap here https://wisepick.org/best-all-in-one-record-player/, number one, but I guess I'll change it for something more advanced soon after I get used to turntables. Back to backpacking, I chose my first one 2 years ago when I decided to do a 5-day hiking trip. I spent hours digging into different options and eventually chose Osprey Fairview 55, as it was highly recommended by the wirecutter. Great pick, still taking it on my trips.